Team preparation begins with the team’s personnel roster, where members can manage their own contact information and personal equipment. 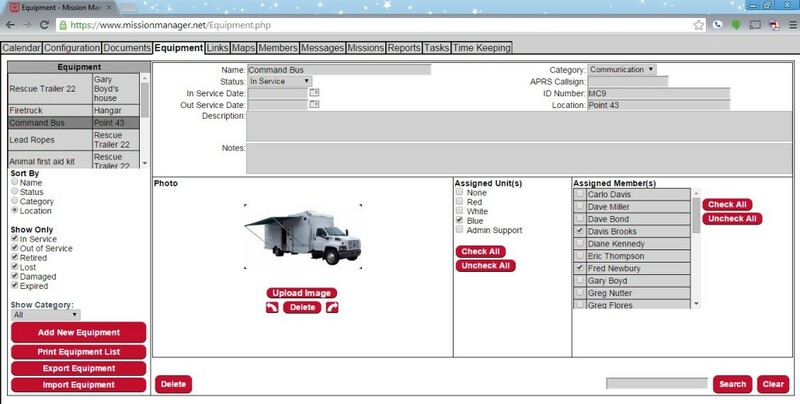 Additionally, Mission Manager allows administrators to keep track of their team’s equipment and maintenance schedules. At the heart of Mission Manager is the team’s personnel roster, which includes members’ photos, basic contact information, emergency contact information, allergies and medication information, along with their issued gear and certifications. Mission Manager will also send email alerts to members if their certifications are set to expire and periodically notify them of their status. Organizational charts can be generated based on each member’s information, such as unit, rank and position. The system also provides granular permissions, enabling administrators to grant members access to various levels of team management. Mission Manager allows administrators to keep track of their team’s equipment, including vehicles, shelters, trailers, aircraft, boats, generators, sanitation and gear. They can track the in-and-out of service dates, the location of the equipment and the personnel responsible for maintaining the equipment. It also includes photos, description and notes pertaining to the equipment. The most widely used incident management tool. Oversee all team planning, training and operation. Manage all missions at any scale. Mission Manager is user-friendly, cost-effective and highly customizable. We view current and prospective users as trusted advisors on how to continue making Mission Manager the best incident management tool available. Please contact us with any questions or comments you may have. We look forward to hearing from you.